Some facts… I’m good at eightball pool. At 16 I was invited to play for my senior county team and some 25 years, two trials for the England team and one national title later I’m still playing at county level. So I’m still good. The problem with being good at something, though, is that it’s a constant battle to maintain standards. When you can do something to a high level it’s frustrating when you struggle to maintain that level. So being good at something does carry problems. Fortunately at hapkido I never experienced these issues. Having no martial arts experience and limited ability any minor success in class was a triumph rather than a failure. And as much as it annoyed me to pretty much get everything wrong for the first two years I didn’t beat myself up about it. After all Hapkido was something I did for fun. Some seven years later and with a black belt grading looming, however, and that’s not an excuse I can use any more. I’m no longer quite so useless and the desire to maintain a standard is now as necessary in my martial arts studies as it is when I grab my cue and head off to a match. The bedrock of any cue sport is the stance. The theory is that if you have a balanced stance you are much less likely to move on a shot, which is a common cause of missing a shot. In short the more solid your base the better chance you have of lining up correctly behind the shot to deliver a smooth stroke to hit the white ball. In hapkido the stance is also a vital factor. A solid base and distribution of your weight allows you to unbalance and throw an opponent, to launch kick and punch combinations, and to torque your hips to generate additional power without losing balance or leaving yourself vulnerable. In both disciplines a stable connection to the floor is vital and a good stance is quite literally the foundation of everything. In pool how you ‘deliver’ the cue is a key factor. Beginners struggle to maintain a smooth stroke when holding a cue. 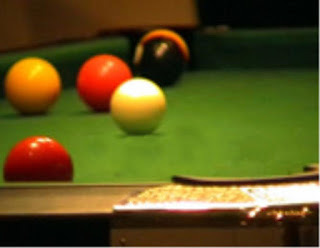 Their legs, bodies and arms move so when they aim at the white ball they often tend to stab at it from a variety of angles because they haven’t mastered the ‘delivery’ of the cue. 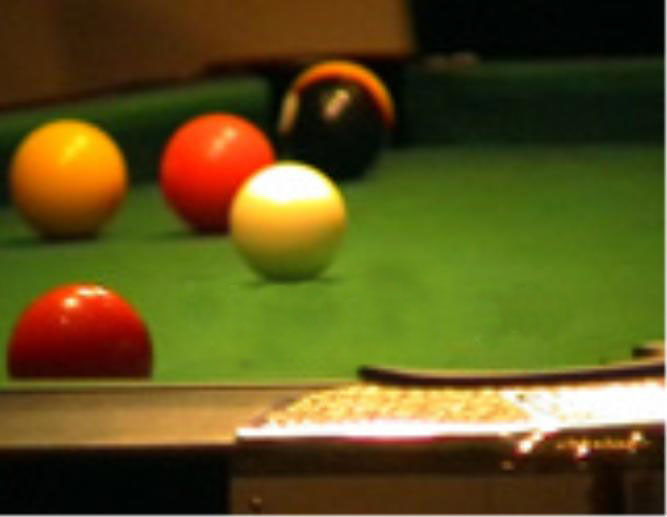 To ‘deliver’ a cue through a shot requires a fluid motion that starts with a backswing then accelerates the tip towards the white ball until it strikes it before it returns to a starting position. It is a simple and elegant motion that is neither dramatic nor exciting but consistent and smooth. To my mind delivering a kick or a punch requires a similar understanding of the mechanics involved. Punches and kicks are fluid motions that have a definite start point at their initial chambering and a definite contact point as they strike their target before reverting back to a guard position. Both disciplines have ‘delivery’ systems that rely on repeating simple, fluid mechanical actions. But such simplicity in both disciplines in only based on hours of practice. Maintaining focus when playing in tournaments can be a demanding experience. Most individual matches last about an hour and if you get to the later stages of the event you’ll have won four or five matches and will have spent up to nine hours in the venue. To help retain focus during matches I have mental routines I go through before getting down to play the shot to ensure I’ve analysed the situation and worked out my best option. I adapted some of these habits into hapkido so now if I’m sparring I try to maintain a certain body shape. It helps by programming my body and mind into understanding that I’m sparring… in much the same way that touching my watch when it’s my turn to take a key shot at pool reminds me to take the time to check my options. Interestingly the issue of focus is one area where the study of hapkido has influenced my pool game. I realised a while ago that it’s no accident that my best hapkido lessons usually follow a ki class. And that’s because my body is relaxed and my mind is clear so I can easily tune into what I’m doing. So if I’m struggling with a technique instead of getting annoyed I mentally step back from myself and analyse what’s wrong. And this is something I’ve brought into my pool game a lot in the last year because if you make a mistake at pool it’s often tempting to try to rescue the situation by playing a high-risk but low-percentage shot. And in my youth I was able to get away with that approach but these days I no longer have that same on-the-table aggression so I’ve borrowed a lesson from my hapkido and I step out of the situation, analyse and find a smarter option. The main truth I’ve rediscovered, though, is if I want to keep playing pool at a high level then I have to put the hours in on the practice table. And that means running drills to keep my basics consistent. And the same lessons apply at hapkido.